In a cold climate, such as in Melbourne, Australia, the summer is never quite long enough to grow all your summer annuals vegetables, such as tomatoes, chillies, capsicums and so on. The best way to get a long productive season is to start the seedlings early indoors, so they can be planted out in the garden as soon as the weather is warm enough. By sowing the seeds earlier, the plants will of course fruit earlier, and with warm weather continuing after fruiting, they can then produce a second round, doubling your yield for the season. The summer vegetable seeds can be started indoors in later winter (August in the southern hemisphere), so the plants have a few weeks to grow enough in size to be planted out time for spring (September in the southern hemisphere). The advantage of starting plants early indoors is that you can continue your gardening grow plants while the weather is still too cold outside, and you can utilise the heat within the house to not only warm yourself in late winter, but to grow your plants as well. It’s very easy to start seedlings indoors, there isn’t much you need, and you’ll see results in a week! There’s a few points I’d like to bring up in regards to planting seeds which are worth discussing. 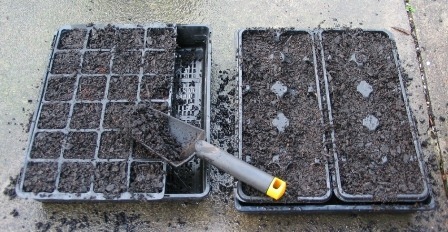 The first is the matter of growing medium and the second is direct sowing versus sowing on containers. Growing medium is basically the medium (the “stuff”) that you grow your plants in. Plants do grow in various materials, from their natural soil to a range of man-made potting mixes. The textbooks will insist that you specifically use “seed raising mix”, you can find small bags of this in commercial stores, and it’s fairly expensive, but the reality is that you don’t need it. Seriously, a lot of it is just plain bunkum. Seeds have been naturally falling on soil and sprouting without human intervention for the last few million years before commercial seed raising mix was ever thought up. From personal experience, I find that in practice you can use virtually anything that plants will grow in to raise seeds in. Sure there’s common sense, if you’re planting very fine seeds you might not be able to use a really coarse mix with large pine bark pieces in it as it wont surround the planted seeds closely enough to retain moisture, and soil can retain more water retentive than artificial mixes, which may be a concern for moisture sensitive plants, but this is not a problem for annual vegetables, they grow in anything. Just keep in mind that gardening, if done sustainably, is all for free, as nature provides everything you’ll need. My folks have been starting their vegies indoors for as long as I can remember, in plain garden pots filled with garden soil, Did it work? To put it simply, it worked brilliantly. Just keep in mind that gardening, if done sustainably, is all for free, as nature provides everything you’ll ever need. 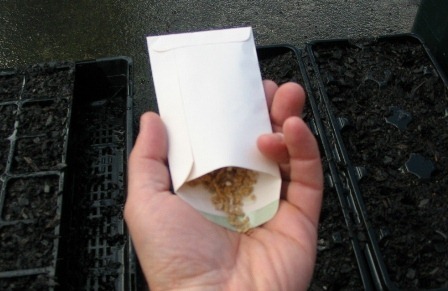 Working in the garden nursery industry, I meet many gardeners who have had problems sowing seeds in seed raising mix – they find that their seeds sprout but their seedlings only reach a very small size and then STOP GROWING, and the resultant seedlings are very thin and spindly! That’s because seed raising mix has absolutely no nutrients in it, and is totally unsuitable for sowing seeds in. It’s actually misnamed, it really should be called SEED COVERING MIX, because that’s what it’s designed for. You need a nutrient-rich mix underneath such as quality potting mix to raise seedlings! Most seeds can be sown into pots or punnets (flat seedling trays), and then be transplanted into the garden or even into bigger pots. But there are some plants that don’t take too kindly to having their roots disturbed, and become badly affected by transplanting, so these plants must be directly sown, that is, the seeds are put into the ground where you intend the plant to grow. Sowing seeds is not that difficult, there are a few basic rules to follow, and nature does the rest! The general rule for planting seeds is that they should be planted three times as deep as the diameter of the seed. There’s no real need to get this exact, as seeds will often germinate regardless of soil depth, just try to get it fairly close. Follow seed packet instructions for planting depth, and if sowing directly into the garden, follow the recommendations for spacing – how far apart from each other the plants should be spaced. Most seeds need to be buried, while some seeds require light to germinate, and prefer to be sown directly on top of the soil. This will be specified on the seed packets. Note – if you’re collecting your own seeds or are given seeds, and don’t have “instructions”, you can look up the seed sowing recommendations in a good gardening book or search for the information online. A container to hold the soil that you will grow your seeds in. A drip tray of some sort to place under your container to stop water running everywhere when you water your container. Here are the basic steps, they’re quite straightforward and easy to follow. 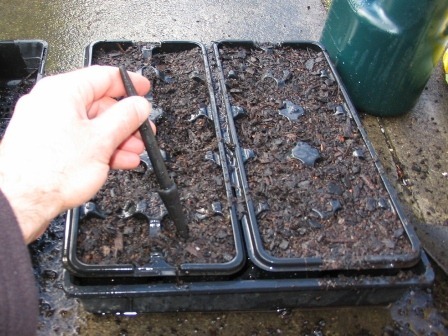 As well as being an instructional guide for starting annual vegetable seeds in pots, this set of instructions is also a basic guide in seed planting for any kind of seeds you wish to grow. Firstly, you’ll need some kind of container to plant your seeds in. You can use anything that can hold your growing medium (seed raising mix, potting mix or even regular garden soil) and that has holes in the bottom to let excess water drain out. 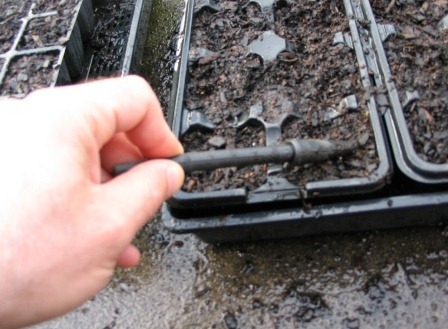 Here I’m using a seed tray with plastic seedling containers (pictured below), because the divided sections keep the seedling roots separate and makes it easier to pull out the seedlings for planting. Fill your container with your growing medium, such as seed raising mix, potting mix or even regular garden soil. Level off the surface of the growing medium and pick off any large particles such as rocks or pieces of bark in the mix if present. 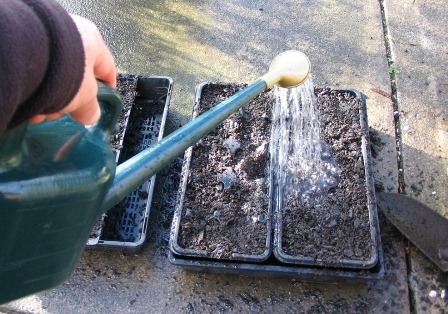 Water the growing medium to dampen it, it needs to be moist as seeds need moisture to germinate. Next, you’ll need a tool to make small dents of the correct depth in the surface of the growing mix to put the seeds into. 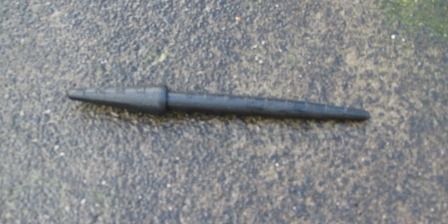 The tool for this is a dibber (also called a dibble) – this is a just a pointed stick for making holes in the ground so that seeds, seedlings or small bulbs can be planted. You can substitute a chopstick or a pencil or any other such implement for this purpose. Shown below is a picture of one made of plastic, with depth measurements along its length. Press the end of the dibber into the surface of the growing mix to make small holes approximately three times deeper than the diameter of the seeds. In these trays pictures, I’ve made two holes per section so I can put two seeds in. That way, if one seed fails to germinate, the space will be occupied by the other seedling and doesn’t go to waste. Take the seeds you wish to plant. pour some into the palm of your hand, and then pick the seeds one by one and place them in the holes made with the dibber in the growing medium. If the seeds aren’t very viable, and don’t have a high rate of germination (that is, they don’t always sprout), you can put more than one seed into each hole. Use the dibber to close up the holes with the seeds in them, push the moist growing medium in to fill the holes with the seeds in them. When planting up containers such as the ones pictured, you can just label each row, just make sure you’ve planted the same thing in each row though! Here, I’ve planted two varieties of tomato, Australian Red Tomatoes and Cherry Tomatoes, and some Rhubarb. The Rhubarb seedlings will look different to the tomato seedlings, but the tomatoes will both look the same, hence the use of labels! 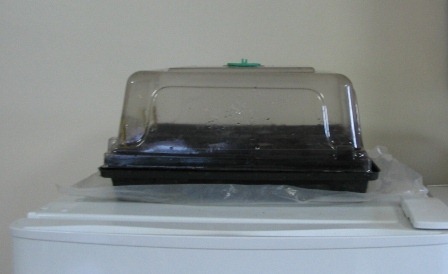 The seedlings will eventually need to be watered, and if the seedling tray is going to be inside, you’ll need some form of drip tray underneath the container (as pictured below) to catch the excess water so it doesn’t run all over your furniture! Place the drip tray under the container, as shown below, as the container will still be dripping wet on the bottom. 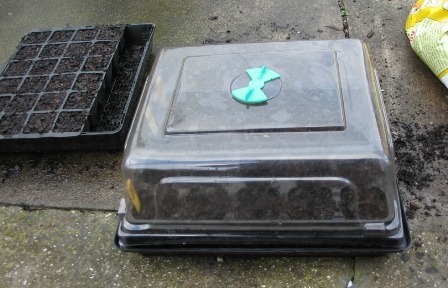 Place a cover of some sort over the container to keep the moisture in until the seeds have sprouted. You can use a piece of glass, timber, cardboard, cling-wrap, whatever will cover the top of the container. This will only stay in place until the seeds have come up, then it will need to be removed to give them light and space to grow. 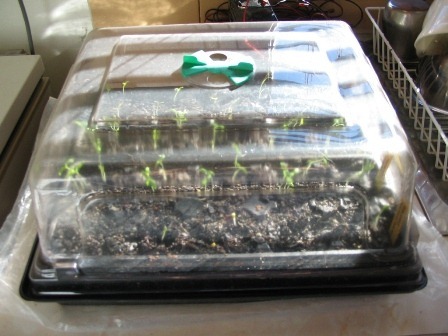 In the picture I’m using a plastic propagator lid, which is designed to fir with the trays. This has the advantage of being high enough to permit some vertical growth, and lets light in. The green “butterfly” vent can be turned to open the holes in the lid to let air in, or closed to retain heat, making it a mini-greenhouse. It’s a luxury, but not a necessity. If you think you need the fancy gear to grow seedlings, think again! 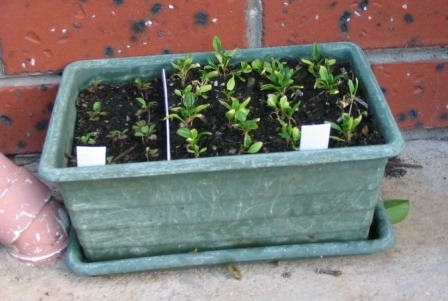 Pictured below is a cheap plastic pot, with tray below it, filled with spinach and rocket seedlings. This weather beaten old pot, year after year, has been filled with garden soil from the backyard, sown with tomato seeds, covered with a scrap piece of wood, and placed on top of the kitchen cabinet. From here hundreds of productive tomato plants have sprung forth! Place the covered container on top of the refrigerator (as pictured below) – if this is a warm spot, place your hand there first to check, if it feels warm, it’s a good spot to use. Somewhere high up near the ceiling also works well, as heat rises and it will be warmer higher up. A warm sunny window is also good. Make sure you check every few days to see if the seeds have sprouted, for once they have, the cover needs to come off and they need exposure to sunlight. If you forget them there too long covered up or in low light, they will become tall and spindly, bent and misshapen. When the seeds sprout remove cover, and put them in a place where they can receive enough sunlight to grow, while still staying warm indoors. 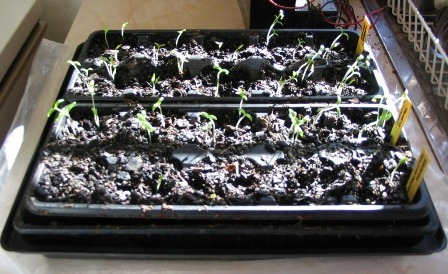 Pictured below are the seedlings – tomatoes and rhubarb, after 7 days. I’ve opened the vent at top to let air flow through (so they don’t get too damp and get mouldy) and I’ve placed them on a kitchen bench that gets midday sun. Water the seedlings when they need it, and give them a weakened organic fertilizer weekly, you could mix up a half strength fish emulsion for example, and some seaweed extract or worm casting liquid might help too. Shown below are the same seedlings, with the cover off. 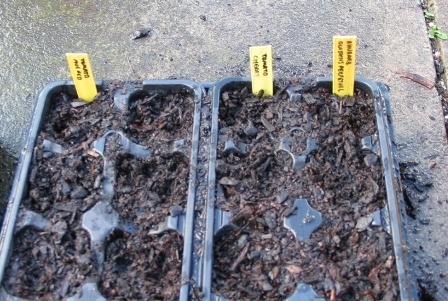 These will grow over the next few weeks until the weather is warm enough to plant them out in the garden. They can also be transplanted out into bigger pots for faster growth when the time is right. The rule with transplanting seedlings is to do it when they get their first pair of “true leaves”. The true leaves are not the original long, thin leaves that come up when the plant first sprouts, but the next ones that grow, which will be a different shape and resemble the mature leaves, but just be smaller in size. When the plants are big enough, and the last frosts have passed, the seedlings can go into the garden, ready to lap up the sunny weather and grow, grow, grow! Starting your warm season annual vegetable seedlings indoors in late winter is a great way to get a good head start of a few weeks before spring arrives. By the time the weather is suitable for planting out seedlings, you’ll have nice strong seedling plants that will better survive pests and inclement weather! Thank you so much for this information. You wouldn’t believe how impeccable your timing is! 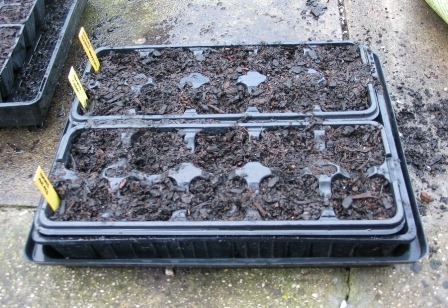 I have just been sourcing some seedling trays etc to start doing this very task. Last time I tried this it failed miserably. Not sure why, maybe too wet or too dry or too early in the season? I will be following your tips very closely to ensure success! Hi Michael, hope the seedlings go well this time round! Thanks for the feedback, I’m aiming to write up articles that are seasonally relevant, so people can read the DIY articles and give them a go straight away without having to wait for a change of season. Great Site Angelo and good to see you with Geoff in his recent video. Just an FYI on starting seeds in plain garden soil for those out there. I tried it and maybe 1/4-1/3 survived. Its because of a thing called damping off. Basically the seed sprouts. It starts growing and then it just dies. The soil is moist enough, its getting good light and air circulation, still the seedling dies. From what I’ve found online its because there are pathogens/bacteria/mold/etc whatever it is in the soil that inhibits strong seedling growth. Didn’t seem to make sense to me because as you say seeds have been falling to the ground and growing for millions of years in plain old soil. Don’t know how to explain it any better but all the sprouts that died looked exactly like what they call “damping off”. Maybe the soil was too heavy, maybe I should have mixed in something finer? I am now trying a store bought seed starter mix(even though I’m strongly against the idea), we’ll see how it goes. Thanks for your comment, you’ve raised a good point. It really does depend on the quality and health of your soil. If you have a healthy, rich, friable, well draining organic soil, it helps both plants to grow and seeds to germinate, after all, that’s where plant seeds have evolved to grow! Growing up, my folks always used soil for raising vegie seedlings, and we always had the biggest strongest plants as a result. I guess they always knew which soil was good for that purpose! If the soil is heavy, with too much clay, doesn’t drain well and you try to grow seeds in it, then the seedlings will have too much moisture around them and they will be attacked by fungal diseases, ‘damping off’ is an attack by soil borne pathogenic fungi. If your soil is unhealthy, heavy, or of poor quality, then it is not ideal for using as a seed raising mix in pots for raising seeds in. Better to get a seed raising mix or make your own. As a cheaper alternative to seed raising mix, I recommend buying a potting mix which is fairly fine grade, that is, with very few large coarse pieces in it, and put it through a garden sieve to take out the larger particles. Use the fine mixture that goes through the sieve to raise your seedlings in. Even cheaper yet is to use coconut coir, the stuff you buy in a compressed block that you soak in a bucket of water, which expands into a very fine dark brown crumbly medium, I’ve used it for both cuttings and seeds, and it’s way cheaper than any other propagating medium. This was very helpful. Thank you for sharing your knowledge. As long as the snails don’t mow down the young cucumber seedlings (by protecting them), they can probably be sown directly! Bean seedlings seem to transplant fairly well here, they’re very popular in garden nurseries, but as with all seedlings, minimise root disturbance, ideally by planting in separate seedling containers so that seedlings don’t have to be torn from one another’s roots at planting time. You look wonderful, your voice is wonderful and your garden is one piece of paradise. Wish you that your garden is blooming forever. Thanks, so nice to receive such a lovely compliment! Hope your garden is looking amazing too. I guess I really love what I do, and love sharing it with the world, and I feel blessed to have all that.